RJV 's Blog: Angular.Js - Funny parser !! You will need a HTML5 compatible browser to try this but it will be sure to rock you. The funny part is line # 5. You are welcome to leave funny or witty comments. Please do not get overboard over the technical aspects, though. If you remove the line, the result will be 5 !!! 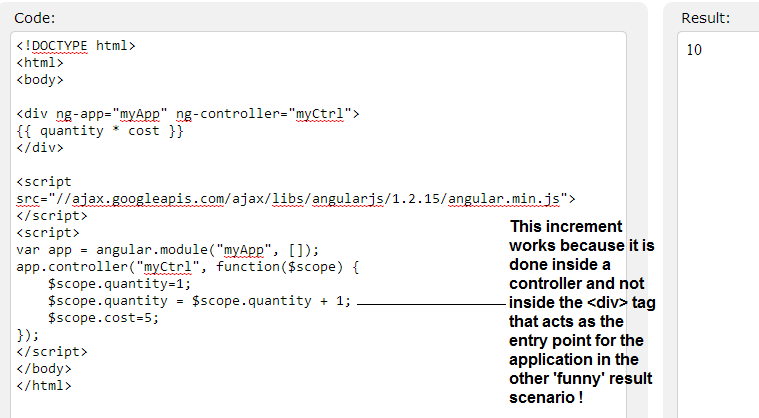 tag that was the application's main entry point in the above scenario (where ng-init is initializing the 'quantity' variable but the increment was happening inside an AngularJS expression), is now being used as a controller by the module. The $scope of the controller is the application (the div tag) it is referred from. But the good thing is that there is no index out of bounds exception and so the control moves to the next line even if the index used for an array element is out of bounds !! And, the best part is it works like the good old pointers !! Labels: Angular JS, J V Ravi Chandran, Ravichandran J.V.